It's the time of year that most cooks roll out the obligatory sweet potato dish, disguised with a sweet syrup, pecans and marshmallow topping. The seasonal menu requires that sweet potatoes be on the table, regardless of how family members feel about them, and after the holidays, the sweet potato is banished into Culinary Purgatory, only to appear again the next winter. This ancient and healthful vegetable gets no respect, and it's time to set the record straight. The sweet potato is native to the Americas. It has been cultivated by the indigenous peoples of Central and South America for thousands of years. Columbus found it growing all around the Caribbean during his voyages and brought it back to Spain where it was then distributed throughout the world by the exploring fleets. Readers may be surprised to learn that the sweet potato is actually a form of morning glory. Its Latin name is Ipomoea batatas. The Native peoples of the Americas called them batatas . It’s easy enough to see how the name could be worked through several translations and ba-ta-tas became po-ta-toes. Since both vegetables were from the Americas looked somewhat similar and grew underground, the Spanish explorers who were not trained in plant taxonomy assumed that they were related, and the name stuck. The sweet potato was embraced and cultivated in all warm or tropical climates. It was a tasty source of nutrition that was easy to grow. Popular in Asia and the warmer parts of the Americas, it has failed to catch on in cooler Europe and the Mediterranean Basin. Experimental plantings are now being done in the warmer parts of eastern Europe and Australia to introduce those people to the nutritious sweet potato. This odd looking tuber is full of nutrition. 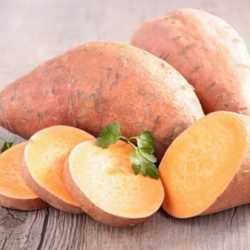 Four ounces of cooked sweet potato have an amazing 21822 IU of Vitamin A and 348 mg of potassium. It is also a significant source of protein, fiber, Vitamin C, calcium, folic acid, and magnesium. That’s serious nutrition for something so simple and inexpensive. Sweet potatoes were 25 cents per pound here in west Kentucky last week and as cheap as 10 cents per pound further south in Mississippi and Alabama. 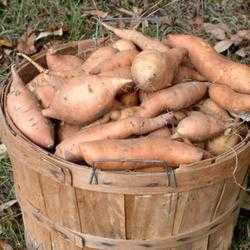 It is one of the few fresh foods that people from all economic walks of life can afford, as we in the South know well. We love our sweet potatoes here in the South. The long hot summers are great for their culture and they produce well for the amount of labor involved. We feed them to our families and to our livestock. One of the easiest vegetable dishes in the world is to throw a couple of sweet potatoes in the oven on a cookie sheet, bake at 350 for an hour, peel, butter, and serve. They’re a great way of extending the meal when a couple of unexpected mouths show up for supper. I much prefer it over the other time-honored Southern tradition of adding a cup of water to the pot for every extra mouth! Baked sweet potatoes are becoming a popular alternative to regular potatoes in restaurants. Most often served with butter and cinnamon sugar, they make for an unusual side dish. They are just as tasty and in this author’s opinion, more so, with simply butter, salt and pepper. Those living in warmer climates can grow their own sweet potatoes. They need between 80 and 120 days to mature, depending on the variety. Long, hot, dry summers are preferred and they need to be harvested before first frost. Sweet potatoes are not grown from seeds or from chunks with ‘eyes’ like the white potato. One must encourage the potato to sprout and the resulting slips are then pulled from the sweet potato and planted. 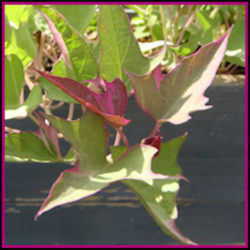 Simply cover with an inch of damp potting mix, and or, sand, and keep in a warm area until sprouts start to form. Add another inch of the mix and let the slips grow until they are 6 to 8 inches tall. They are then pulled from the parent tuber and planted in wide, loose hills. Space the slips about at least a foot apart and allow 3 or 4 feet between rows. The vines can get quite long and wild, so leave sweet potatoes plenty of room to spread. Light cultivation is only necessary until the vines choke out the weeds and although there are several fungal diseases that affect sweet potatoes, by purchasing the parent tubers or slips from a reputable source, those can usually be avoided. Harvest sweet potatoes in the early Fall before the first frost. Carefully dig the hills and lay the harvest in the sun for a few hours to dry. This helps cure the skins so they will not be as fragile. Continue curing in a warm place with high humidity for about 10 days. This helps the storage properties of the sweet potato to improve. After that, simply store in a cool, dark area between 50 and 60 degrees. Any cooler than that and they tend to rot. Give sweet potatoes a chance the next time you find them for sale. They’re cheap and easy to prepare. Packed with nutrition, they make an excellent choice for a side dish or as a light supper by themselves. Sweet potatoes have a history that goes back before written records. They have stood the test of time and are gaining in popularity throughout the world. Show your family that the sweet potato is more than just a obligatory addition to the holiday menu. They can be enjoyed throughout the year and deserve culinary respect from young and old, rich and poor.